Here are some notes from one of Ace's home for the weekend handlers on their recent trip to Stop and Shop! 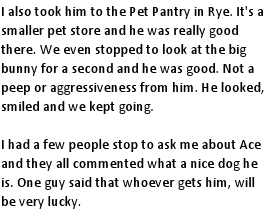 Next stop was the Pet Pantry in Rye NY! Way to go Ace your doing great! Ace "aced" Stop and Shop! way to go ace,keep up the wonderful work you are doing.